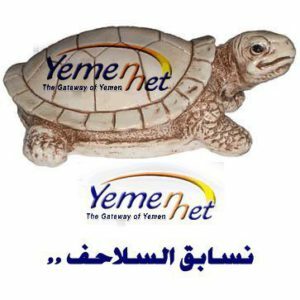 Image circulated on social media depicting YemenNet, the country’s sole ISP, as slow as a turtle. December 4, 2012. On Thursday night, the Houthis, the northern Yemen-based insurgent group in control of most of Sana’a since 2015, completely shut down the internet for close to 30 minutes. Earlier in the day, the group took measures to disrupt and limit access to the internet for the second time in one week. These measures violate the Yemeni people’s fundamental rights to freedom of expression and access to information. The recurring disruption of the internet makes it difficult for civilians to communicate with others and jeopardizes the fragile state of press freedom in Yemen, where a bloody conflict has raged since 2014. The Houthi-controlled Ministry of Communications and Information Technology has a history of tightening its control over the internet. When the Houthis took over the ministry in 2015, they filtered various news sites and in April, the group temporarily shut down the internet in Aden. The Houthis repeated this tactic last night, as YemenNet, the Ministry of Communications-controlled internet service provider (ISP) — the sole ISP in the country — shut down internet across the country for around half an hour between 10 p.m. and 11 p.m. UTC+3. Earlier in the week, the Houthis targeted news sites, mainly those affiliated with the General People’s Congress (GPC), the party of slain former President Ali Abdullah Saleh, such as Khabar News Site, according to Fahmi Albaheth, the President of the Internet Society Yemen Chapter (ISOC-Yemen) who currently resides in Aden. Before Thursday’s shutdown, the Houthis had also been throttling, or intentionally slowing, internet speeds across the country, according to several online sources who complained that the internet has been particularly slow. Walid al-Saqaf, co-founder and chairman ISOC-Yemen, told SMEX that YemenNet regularly throttles the internet and that this practice continued during these two disruptions. Border Gateway Protocol (BGP) Data depicts the outage of the internet in Yemen on the night of Thursday, December 7. Prior to the shutdown, internet users were unable to reach the social media platforms and communication tools they rely on to access information and connect to each other after YemenNet blocked Facebook, Telegram, Twitter, and WhatsApp. Though the disruptions on Saturday and Thursday mark the most targeted attacks against social media, the Houthis had previously blocked Telegram and used a bandwidth control filter on Facebook, preventing multimedia content from loading. Regarding the timing of the disruptions, al-Saqaf said the decision to limit access on Thursday could be related to the mass dissemination of videos depicting atrocities committed by Houthi forces. The first restriction to the internet took place on December 2, three days after violent clashes erupted in Sana’a between the Houthis and forces loyal to Saleh, a former Houthi ally-turned-foe killed by the Houthis on December 4. Several Yemenis who spoke to SMEX relayed their inability to access social media sites without a Virtual Private Network (VPN), which enables users to bypass internet filtering and other access restrictions. However, the throttling of the internet prevents internet users from downloading VPNs from application stores, such as Google Play, which is critical because YemenNet has also blocked many VPN download pages. Yemenis who already have Tor, a free browser that allows internet users to conceal their location and browse the web anonymously, can bypass blocked websites. Al-Saqaf noted that Yemenis mainly use Psiphon, another open-source internet circumvention tool, but that most of these tools might only be available to those who downloaded them before the internet access restrictions started. However, Signal, a free and secure messaging app, is working well according to journalist Hafez al-Bukari. The blocking of news sites and social media platforms comes amidst renewed attacks on journalists. On Saturday, the Houthis fired rocket-propelled grenades at Saleh-aligned television channel Yemen Today and detained 41 journalists and media workers. In October, the Ministry of Communications outlawed the unlicensed practice of online journalism, which not only hinders reporting on the ongoing war by local journalists but also restricts activists from publishing content on public social media pages. The climate of hostility towards journalists in Yemen predates the emergence of the Houthis. Before the rebel group took control of Sana’a, foreign journalists were routinely expelled from the country for challenging the government’s official version of events. In August 2017, the Saudi-led coalition imposed a series of cumbersome, costly, and dangerous procedures to prevent journalists from entering Yemen to report on the coalition’s deadly blockade and bombings campaigns. The new measures have made it nearly impossible for foreign journalists to report on the humanitarian crisis unfolding in Yemen. The Houthis willful disruption of the internet will make it significantly more difficult for Yemeni journalists to send their dispatches from the ground to the rest of the world. Prolonged and complete shutdowns of the internet will also pose a grave threat to the safety of Yemeni civilians who at any moment can be deprived of their communication tools, which are essential to their ability to receive and share information and contact emergency services in a time of war. Editor’s Note: Internet users in Yemen who are unable to download the Tor browser can send a request to get Tor by email. Requests can be sent to gettor@torproject.org with a note specifying the required operating system. Visit https://gettor.torproject.org for more information.